This title includes a Foreword by John W Bachman, Professor of Medicine, Mayo Clinic College of Medicine, Rochester, Minnesota. Mastering the art of medical practice management requires knowledge that most physicians don't learn in medical school, residency, and fellowship training. Successful practice management in the 21st century requires physicians to understand how to organize and manage a practice, manage their finances, recruit, work with, and manage people within and outside of the practice, improve healthcare delivery and clinical outcomes, and ensure compliance with federal, state, and local laws and regulations. 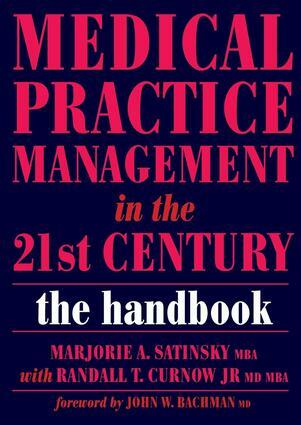 "Medical Practice Management in the 21st Century: The Handbook" addresses multiple aspects of medical practice management. It offers both background information and practical tools. The workbook format, supported by web-based tools, allows busy physicians to gain a basic understanding of many topics, determine strategies for their practices, and seek additional information when they want it. This guide will be ideal for both physicians who need business guidance as they begin their careers and physicians who are already in practice and want to enhance their business skills. Many physicians can't afford or choose not to hire a professional practice administrator or manager; this book will help them assume managerial responsibilities with the same level of confidence that they bring to clinical care. Physicians in academic medical centers who manage departments, programs, or research studies will also benefit. "This book is essential for any clinician planning to open a new practice or attempting to improve the quality and efficiency of an existing practice. Read and learn." - John Bachman MD, in the Foreword. "Written for the busy practitioner - clear, concise, and practical without any wasted space. I wish I had had this resource when I was starting practice. It's the bible for practice management, just as the "Washington Manual" was in earlier years." - Robert S Galvin, MD, Director of Global Healthcare for General Electric. "Important. Crosses many boundaries, covering a wide variety of topics. Guides physicians in developing the infrastructure that they need to succeed." - John Fallon, MD, Chief Physician Executive, Blue Cross Blue Shield of Massachusetts. "There is no better book or resource to use to develop the necessary proficiency to run a first-class, stellar practice than this. All who read this book will be able to ensure that every patient has a positive experience with your practice and will not only enjoy the experience but will tell other physicians, their family and their friends about you and your practice and thus make your practice thrive and prosper." - Dr Neil Baum, Clinical Associate Professor of Urology, Tulane Medical School, New Orleans, Louisiana. "I love the chapter on financial management. It is very complete and gives a non-business major a good grasp of complicated information." - Allen R. Wenner, MD, family medicine practitioner, West Columbia Family Medicine, South Carolina. "I like the format of the exhibits. In the chapter on financial management, the side-by-side problem/solution approach is easily understandable and lends itself to a solution oriented approach. I can spot my own practice's issues and immediately understand what to do without searching through a lot of text." - Tom Sena, MD, President of Raleigh Children and Adolescents Medicine, Raleigh, North Carolina. "Full of good material which I am actively planning to use. Extremely helpful!" - Dr Damian McHugh, President, Raleigh Emergency Medicine Associates, Raleigh, NC. Preface. Introduction. Section I: Getting Started. Creating a Strong Foundation for Your Practice. Organizing and Managing Your Practice. Business Planning. Marketing. Section II: Managing Finances. Introduction to Financial Management. Revenue Cycle Management. Section III: Recruiting and Managing Staff and Outside Resources. Human Resources. Physician Issues. Using Outsourcing Effectively. Hiring and Managing Consultants. Section IV: Improving Healthcare Delivery and Clinical Outcomes. Quality of Care. Using Information Technology to Enhance the Quality of Care, Operational Efficiency, and Revenue in Your Practice. Section V: Ensuring Compliance. Corporate Compliance. An Overview of HIPAA Compliance. HIPAA Privacy Rule and Security Rule Concepts. Appendices. Steps for Creating a Strong Foundation. Business Planning Questions. Sample Surveys. Financial Management Resources. Revenue Cycle Management Aids. Sample Performance Evaluation Program. Sample Consulting Proposals and Agreements. Quality of Care Digest. Resources to Use When Acquiring Information Technology. A Glossary of HIPAA Terms. Additional HIPAA Compliance Resources. Index.